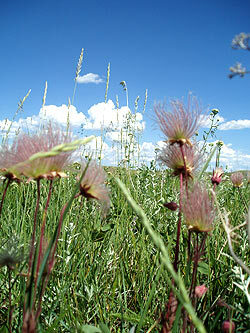 Vision: Healthy native prairie ecosystems as vital parts of our vibrant and strong communities. Our Mission: The PCAP Partnership represents the collaborative efforts of multiple interests toward promoting and conserving Saskatchewan's native prairie. The PCAP Partners work together to deliver innovative and critical prairie conservation activities that represent the shared objectives of a diverse mix of stakeholders and that benefit the social, cultural, economic and ecological fabric of Saskatchewan. Our Ecosystem Goal: Native prairie ecosystem health and biodiversity are conserved and restored as part of a functioning landscape. Our Economic Goal: Sustainable uses of native prairie improve the livelihoods of Saskatchewan people. Our Cultural Goal: Native prairie is a valued part of our culture and identity as Saskatchewan people. Native Prairie Education & Awareness Increase awareness of the importance of native prairie and species at risk, targeting students, industry and provincial and municipal policy makers. Responsible Land Use on Native Prairie Guide native prairie land users with balanced, evidence-based information about ecological footprints and best practices to sustain healthy native prairie and species at risk populations while mitigating human impact. Native Prairie Ecosystem Management Promote the importance of land management knowledge and adoption of practices that have a positive impact on biodiversity, species at risk and prairie ecosystem health.